It’s puzzling at times. You do what you’re supposed to do. You’re on your p’s and q’s. You even have good blood sugars before you go to bed. And then you wake up with your blood sugar sky high. Frustrating. Can even get you down. And sometimes doctors can’t even figure it out. They may blame you like it’s your fault. To make matters even more complicated, the diagnostic criteria for diabetes keeps getting stricter and stricter. It used to be (before 1998) that fasting blood sugar levels ABOVE 140 mg/dl were diabetic. Now it’s 126. And normal fastings USED TO BE 70 – 110. Now they’re 70-100. 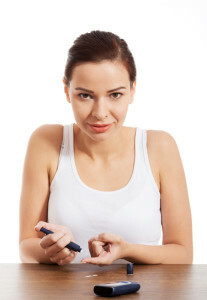 With 100 – 125 being prediabetic, abnormal fasting ranges. Could you imagine how many people the pharma companies could get to take their drugs if they lowered the normal fasting even more to let’s say 90 or 95 mg/dl as the cutoff, and the diabetes diagnosis criteria to a fasting of above 110? I think you know where I’m going here… I digress. Type 2 diabetes can cause your body to overshoot during the late night and morning hours. Out of control fastings could mean one of 2 things: The Dawn Phenomenon or The Simogyi Effect. Now both of these are pretty scientific terms but I’ll give break them down for you. Dawn phenomenon is due more to insulin resistance and your liver producing extra sugar. And issues with insulin production or resistance can cause problems here and cause your blood sugar to go up in the morning hours. The Somogyi Effect is more of a rebounding effect from low blood sugar. This is seen more in patients who are taking insulin. Or this is something that might happen if you have a snack at night. Usually with Somogyi you will have headaches or night sweats. A good way to know for sure, when you have problems with your fasting… is to test your blood sugar at 3am. If your blood sugar is low and the next morning high – usually that’s The Somogyi Effect. If it is high at 3 am and then high in the morning – usually that’s Dawn Phenomenon. Now I’m not a doctor, so I can’t prescribe medications. But the straight forward answer is address the insulin resistance. That is usually one of the issues with type 2 diabetes you CAN control. I know some doctors who have recommended a low carb diet for people who have trouble with fastings after having good blood sugar numbers before bed. Their theory is when you have too much glucose stores in the liver, this can happen. I’m not a big fan of the low carb approach, but you could also try to reduce your carb as some of the doctors that I work with have advised their patients. Prior to using any of this advice please consult with your doctor.